Mango Salsa is a marvelous appetizer. The hot days of summer are upon us so I’m pulling out all the cool and refreshing summer recipes that I so enjoy. Most of these have a Tex-Mex flavor (which I also love). 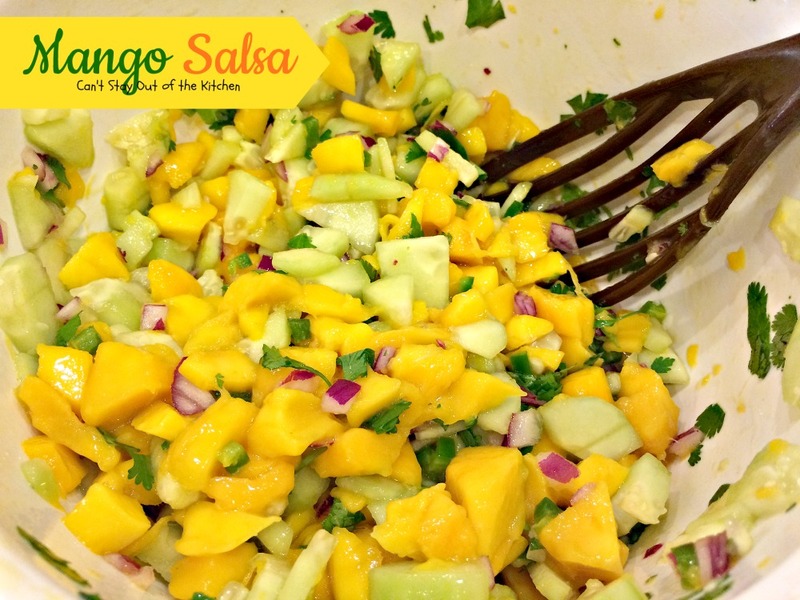 Mango Salsa is one of those fabulous recipes I can’t get enough of when mangos are in season. I like to use the champagne mangos also called ataulfo mangos most of the time. While they are not the easiest to cut, all I do is pare the skin, then I take a sharp knife on one side and cut horizontal lines all the way to the pit. 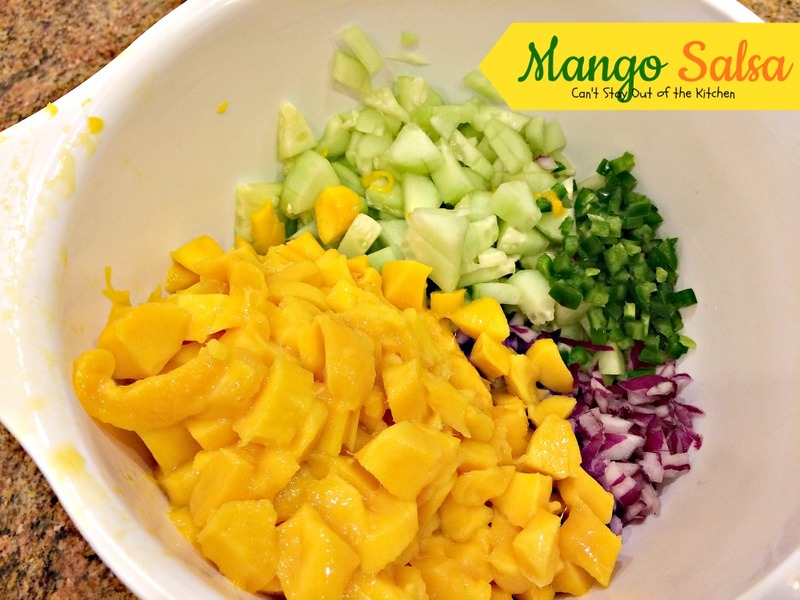 Then I slice down and the mango pieces come off in cubes. I do that all the way around the mango and, all in all, it only takes a minute or two to do each one. Last summer I asked a friend from our Sunday school class (Cyndie) to go with me on a mission trip with our church to the Kaibeto Navaho Reservation in Arizona. Another class member (Lawrence) grew up on the reservation and he takes a team every year to work on projects. I went as a cook and Cyndie was my assistant. 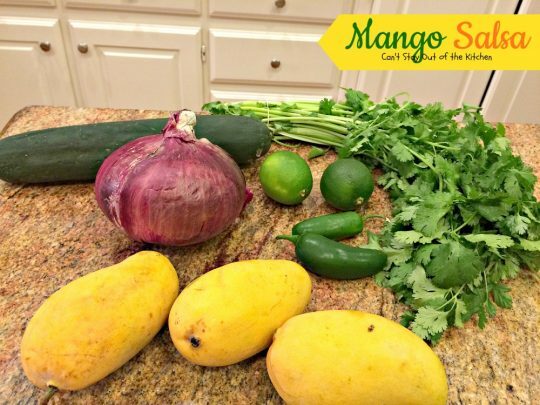 We would drive into down to purchase groceries and at that time (a year ago now), mangos were in season and very inexpensive. 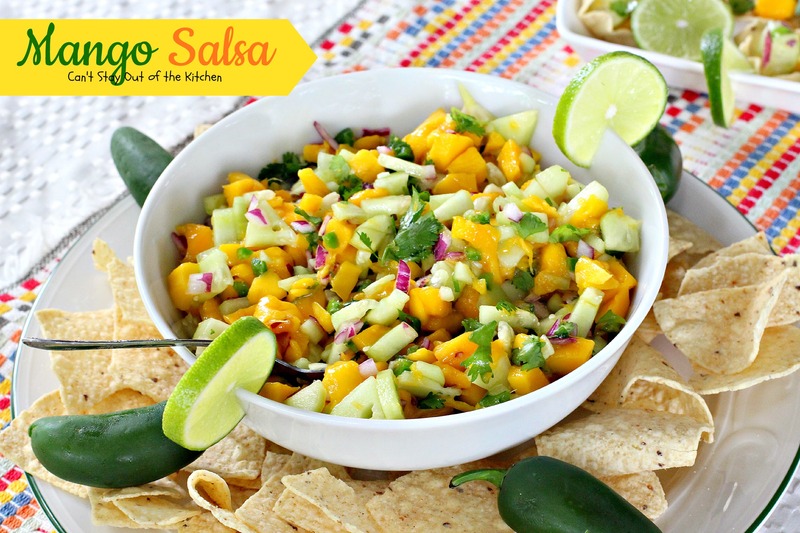 Cyndie volunteered to make this Mango Salsa recipe that was one her daughter, Bryce, made frequently before she went off to college. It turned out wonderfully and everyone loved it. We made and served it multiple times with tortilla chips and veggie dippers and over top of meat, and each time everyone raved over it. 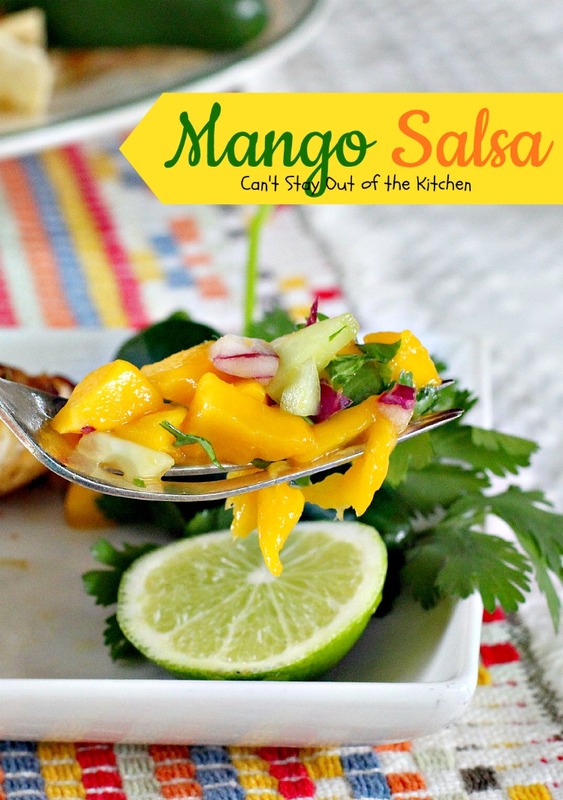 I asked Bryce for her Mango Salsa recipe last summer and she sent it to me, but I forgot to save it, so when I saw mangos on sale again a few weeks ago, I texted her again to try to get the recipe. This is one of those recipes that you taste as you go and add as you desire. I’m providing the amounts I actually used for the recipe but you can increase or decrease according to your family’s taste buds. Another nice thing about this recipe is it’s healthy, gluten free, low calorie, clean eating and vegan. If you serve it with corn tortilla chips you can keep it vegan. You can eat it plain, you can eat it wrapped up in tortillas or you can serve it on top of grilled chicken (which I did), grilled pork chops or grilled steak. It works wonderfully each way. 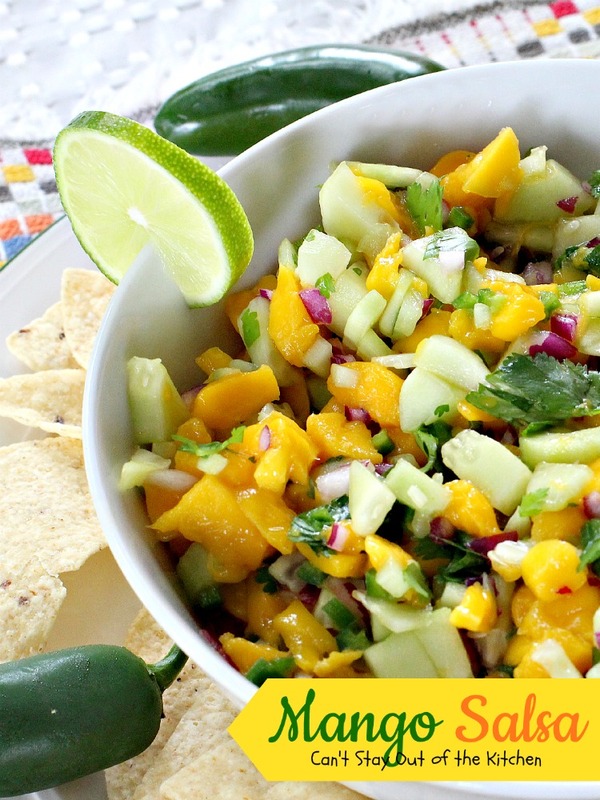 Mango Salsa is so good you can eat it with a spoon, serve it with crackers or tortilla chips, or wrap it up in tortillas, burrito-style. This delicious appetizer is healthy, low calorie, gluten free and vegan. 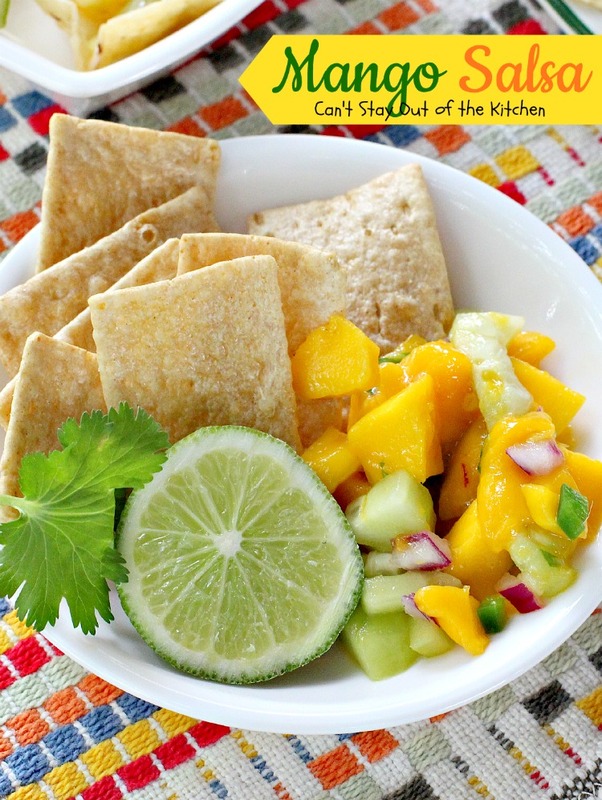 Mango Salsa is great served in tortilla dippers. 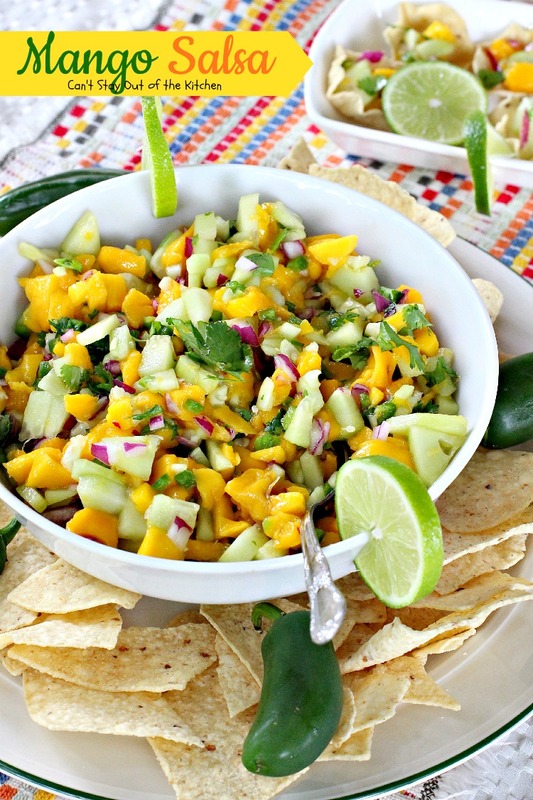 Mango Salsa is a great appetizer to serve for summer holiday fun. I used these ingredients. Instead of regular mangos, I use champagne or golden mangos. 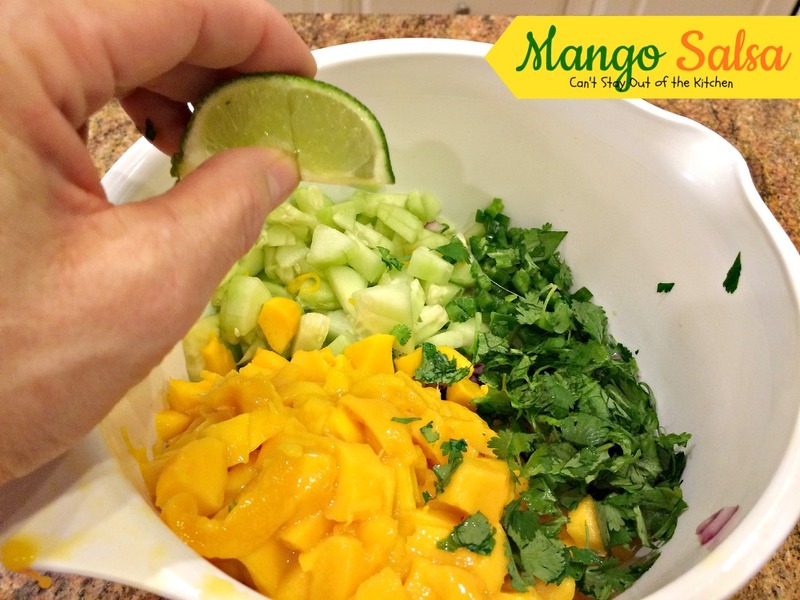 Place peeled and diced mangos and cucumbers in a mixing bowl. Add finely diced red onion and seeded, finely-diced jalapeno peppers. Add fresh, chopped cilantro and the juice of one lime. Stir to combine. Refrigerate until ready to serve. Garnish with a squeeze of fresh lime and chopped cilantro, if desired. 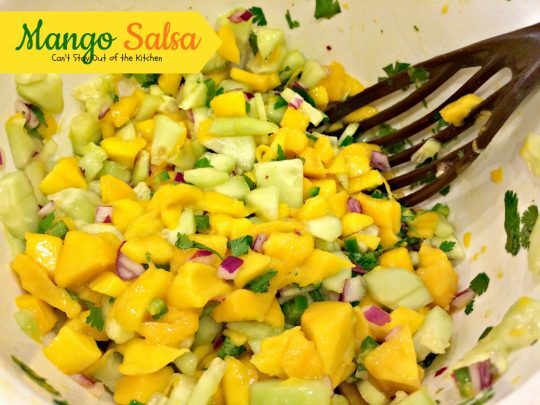 Each bite of Mango Salsa is so delectable you will keep coming back for more. Mango Salsa is a great appetizer for tailgating parties. Cool and refreshing salsa that's great served with tortilla chips, veggie dippers, wrapped in tortillas or served on top of grilled chicken, steak or pork chops. Gluten free and vegan. 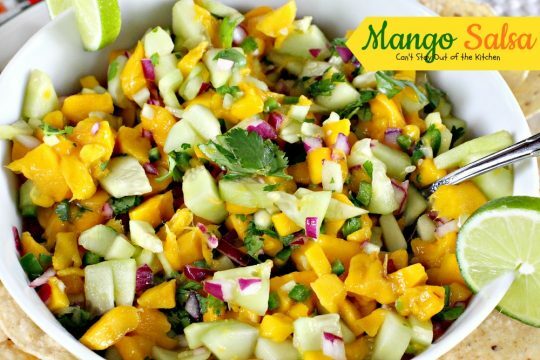 Peel and dice mangos and cucumber; add to a small mixing bowl. Add finely diced red onion and seeded, finely diced, jalapeno pepper. Stir and refrigerate before serving. 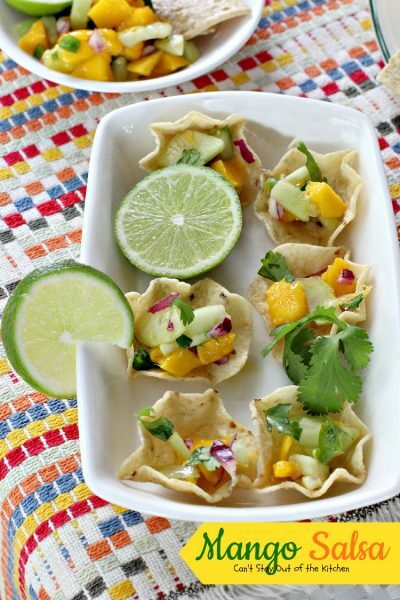 Serve with tortilla chips, veggie dippers, or wrapped in tortillas. You can also serve over grilled chicken, steak or pork chops. Yield: about 3-4 cups salsa. NOTE: This is also great served over Grilled Chicken, Steak or Pork Chops. 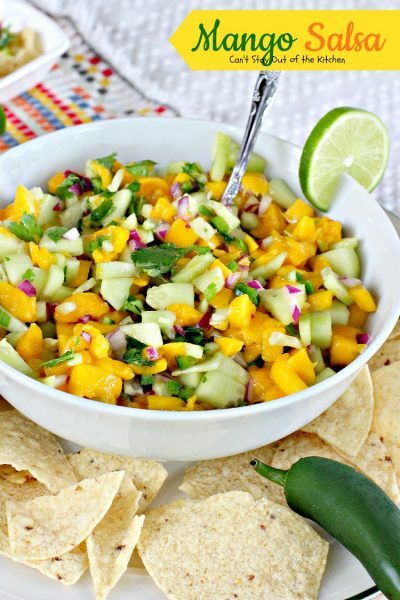 Cool and refreshing salsa that’s great served with tortilla chips, veggie dippers, wrapped in tortillas or served on top of grilled chicken, steak or pork chops. Gluten free and vegan. 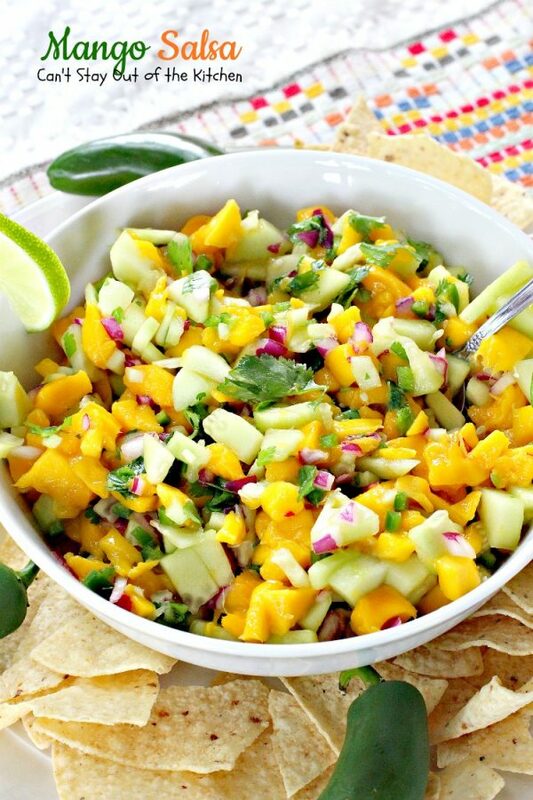 The texture of Mango Salsa is really wonderful. 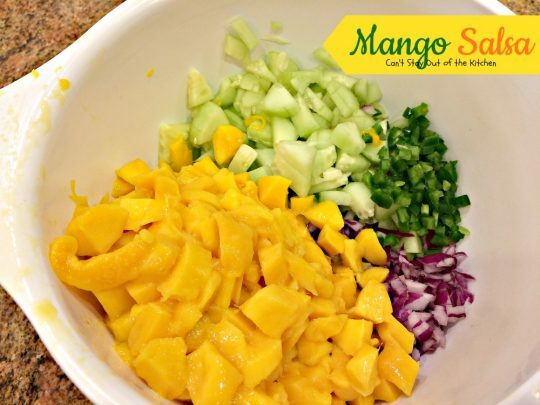 While I used 3 champagne mangos you can also use two of the regular, larger mangos. 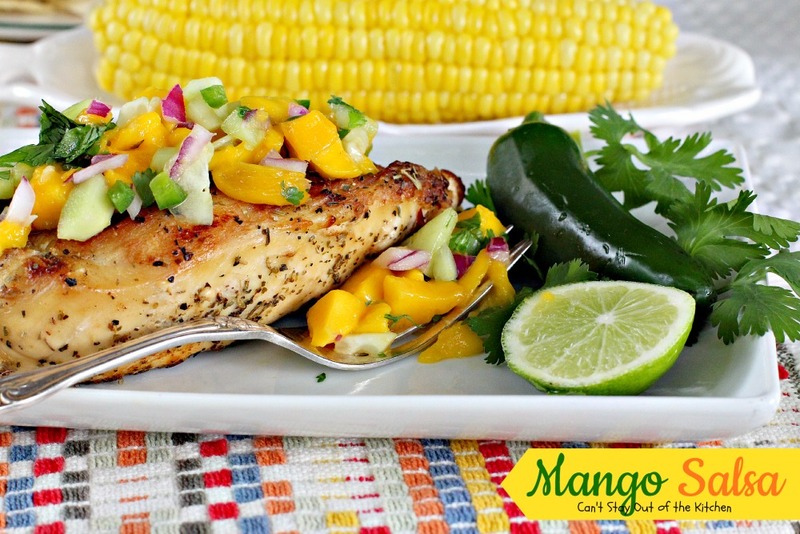 I served Mango Salsa over Grilled Chicken for a delicious healthy, low calorie and gluten free meal.